Hotel Igea has three stars, but we've included it in our budget hotel selection for its low prices. Two streets away from Rome's main railway station, the hotel offers well-equipped and comfortable rooms. I stayed at Hotel Igea anonymously in April 2005, for three nights, and found it a practical and affordable base. Despite its three stars, the hotel is at the budget end of the spectrum, and has the kind of basic, anonymous feel that is common to many of the hotels in these streets by Rome's Stazione Termini. The atmosphere is welcoming, though, with helpful and friendly reception staff who speak good English. Other guests are mostly tourists, with a mixture of nationalities: I hear Italian, Spanish and German as well as English. My room isn't charming but it's perfectly decent, ticks all the boxes, and is more generous in size than many hotel single rooms. The fifth-floor room is at the back of the hotel and my view is a fairly open one, facing the backs and balconies of other buildings. Furnishings are a single bed, desk, chair, suitcase stand, wardrobe with loads of hangers and two coat hooks (useful and often absent in hotels). The bathroom is very nice, and well-decorated apart from the yellow plastic shelf and mirror frame. There is no fridge/mini-bar, and no safe in the room (valuables can be left at reception). I can't get the air-conditioning working, but in this cold weather I'm more interested in the fact that a spare blanket is provided. My room is by the stairs, and I do hear fellow-guests and the lift occasionally, but generally it's fairly quiet. I'm bothered by a buzzing noise which I assume is the lift, but later find out is the electric light. This fitting bothers me a bit: turn it on and it buzzes; turn it off and it glows faintly. Breakfast is not particularly good, though it's typical for Italy. Orange juice, tea/coffee, a tough fresh roll and a selection of plastic wrapped snacks. Service at breakfast is not as good as at reception: the first day I'm ignored until I accost the waitress, whereupon I'm told 'in a minute' - and she continues to lay another, empty table. I feel it's worth attending breakfast for the hot drink and roll, but busy tourists might prefer to skip it altogether, get an early start to the day's sightseeing and pick up a drink and snack in a bar somewhere. On the whole I found the Igea a practical and good-value place to stay. Its proximity to Termini is very convenient - just a short walk with the suitcase on arrival in Rome, and on departure I could leave my case here until it was time to catch the airport bus. Reception staff were nice, and the cleaning staff were about the friendliest I've encountered (when I checked out, one cleaner went to the trouble of rushing downstairs to give me something I'd forgotten). About the only untoward occurence is that one night I return at 11:30 and find the night-porter asleep on a sofa - I can't rouse him so I resort to stepping behind the desk and collecting my own room key. If you're looking for historic atmosphere or individual charm, this isn't the area to look in, but for tourists who want decent clean accommodation at a good price you probably can't do much better than Hotel Igea. Hotel address: Via Principe Amedeo 97. From Stazione Termini, leave by one of the Via Giolitti exits, take Via Gioberti and then take the second left. The hotel is close to the Acquario Romano. 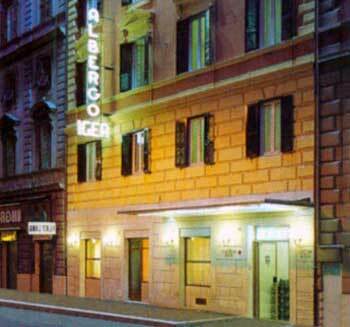 Look for the white 'Albergo Igea' sign on the outside of the hotel building. You can walk to the Colosseum and other sights of Rome, but you'd be better off saving your energy for the more interesting streets, and catching a bus or metro a few stops. The streets around Termini are busy and rather dodgy, but compared with most of the world's large cities they're safe enough (just keep hold of your valuables). You won't want to spend much time in this area anyway; its advantage is its convenience for transport. There are lots of useful shops in the station and the mall underneath, and there is a very handy underground supermarket opposite the Basilica of Santa Maria Maggiore, just down the road. As well as the usual food and supplies, they also sell hot pizza slices and focaccia on the bread counter, making it a good place to pick up a snack or a picnic lunch. Hotel Igea review by an Italy Heaven editor.